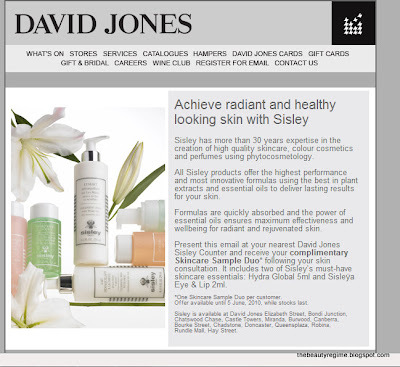 David Jones: Redeem Your SISLEY Skincare Sample Duo! 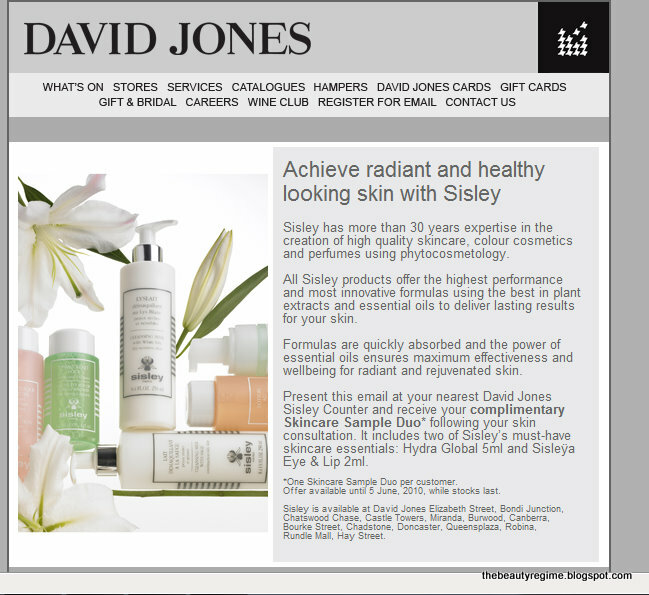 Present this email at your nearest David Jones Sisley Counter and receive your complimentary Skincare Sample Duo* following your skin consultation. It includes two of Sisley’s must-have skincare essentials: Hydra Global 5ml and Sisleÿa Eye & Lip 2ml. *One Skincare Sample Duo per customer. Offer available until 5 June, 2010, while stocks last. Sisley is available at David Jones Elizabeth Street, Bondi Junction, Chatswood Chase, Castle Towers, Miranda, Burwood, Canberra, Bourke Street, Chadstone, Doncaster, Queensplaza, Robina, Rundle Mall, Hay Street. To go to the page, go here.